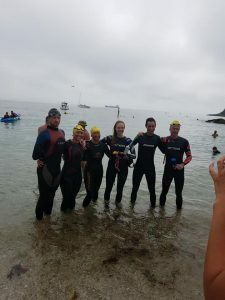 Jodie’s sponsored swim – done!! SHE’S DONE IT! SMASHED IT! 5.7K open water swim completed! The shoulders are burning, the lower back aching, and the back of the neck sore with rubbing-but Jodie’s determination got her through. Dementia UK and K9 Crusaders have their own mermaid! Jodie is off to ease her aches and refuel. The target of £1,000 is within reach. Jodie has done her Nana, her aunt AJ and us proud. We are privileged to have your support, Jodie. Jodie is pictured with her support team at the finish.